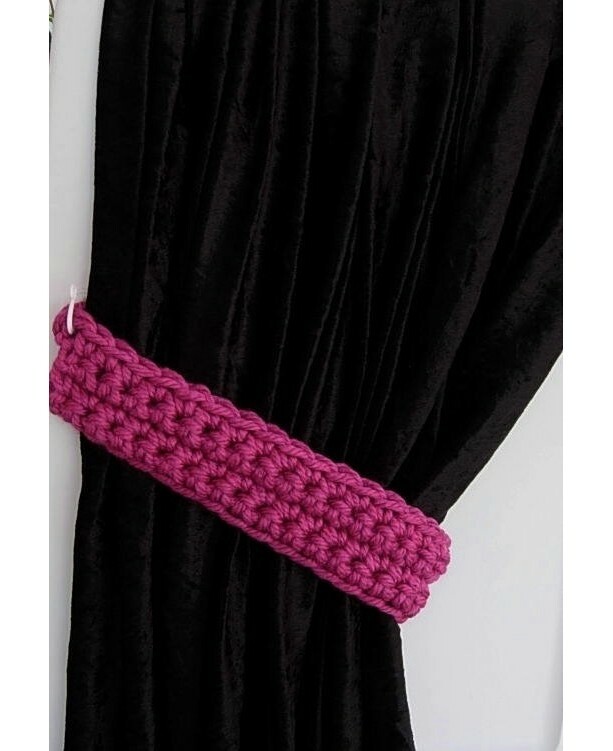 Solid Dark Pink, Fuchsia CURTAIN TIEBACKS - One Pair, 22" long x 2.5" wide x 1/2" thick One Pair of Hand-Crocheted Curtain Tiebacks for use with any kind of curtains or drapes, including shower curtains. I used a very thick 100% acrylic yarn called Hometown USA. 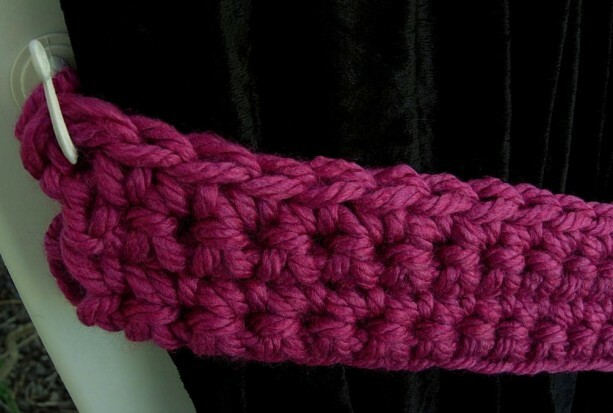 The color is called "New Orleans French Berry," a bright and rich magenta, or fuchsia, pink. 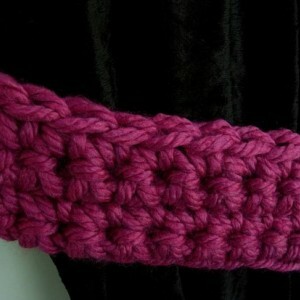 This yarn is very soft, smooth, and has a slight sheen. Different monitors/screens can display colors differently, so If an exact match is needed, I can send swatches for the price of shipping & seller fees. 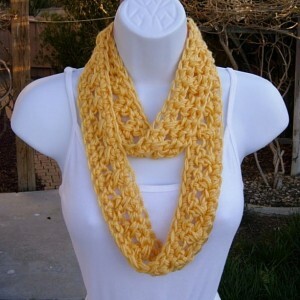 I can make tiebacks in the same style shown with many of the other yarns I use for my infinity scarves. If you happen to see another yarn color in my shop that will work better for you, please send me a message and we can discuss it. 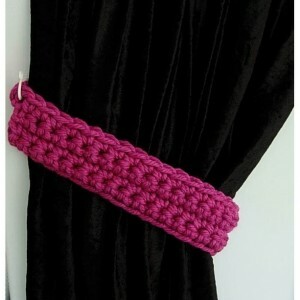 --Unique and Contemporary Styles --Gender-Neutral --Sophisticated Accent Pieces --Create a classy, decorator look by coordinating these unique tiebacks with any simple, inexpensive curtain panel. --Extremely Affordable --Can Be Made In Any Size --Acrylic yarns are incredibly colorfast, washable, and retain their color well. 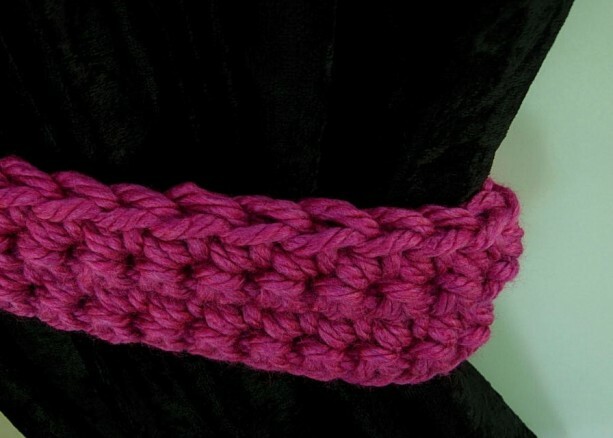 Each tieback has a crocheted loop integrated into each end. 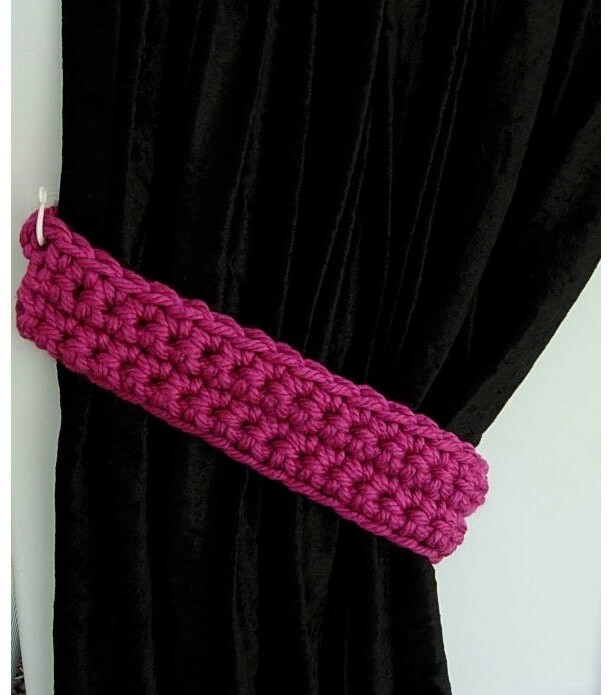 The tieback is placed around the curtain and then the loops are hooked onto a small nail or cup hook (or any hook of your choice, hooks/nails are not included in this listing). 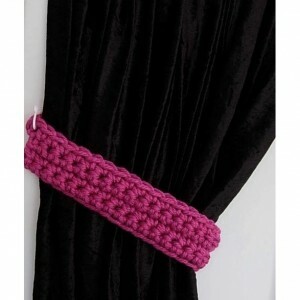 These small loops allow the tiebacks to conform and blend with the curtain and wall really well. In the photos, I chose to use an extra large hook to better show how the tieback is used. In reality, I use very small hooks or nails in my own home. 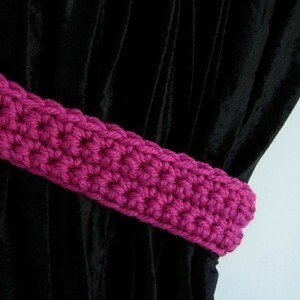 SIZING: The tiebacks pictured are 22 inches/56 cm long, 2.5 inches/6.3 cm wide and ½ inch/1 cm thick. I can also make these in any custom size (pricing will increase a little for larger sizes). 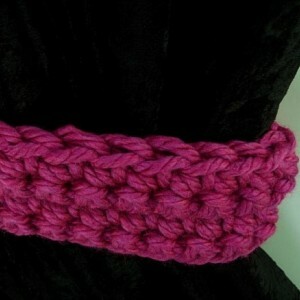 As with all crocheted pieces, these tiebacks will have some give, or stretch. The easiest way to determine what size tieback you need is to wrap a tape measure around your curtains, gathering the curtain until you get the look you want. The measurement should reflect the length starting from the hook/nail, around the curtain, and then back to that same hook/nail. The thickness of your curtains/drapes will make a big difference in determining how long tiebacks should be, so measuring is always a good idea. 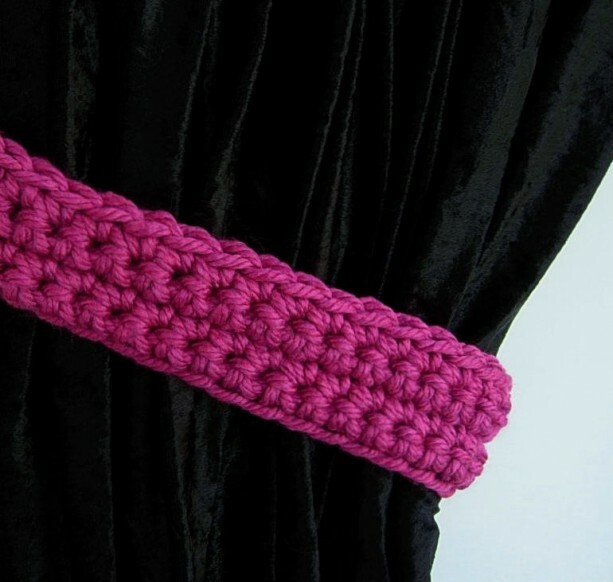 The 21 inch tiebacks are designed for lightweight panels about 45 to 60 inches wide. OPTIONS: I can also make these wider or narrower if you’d prefer. Once again, feel free to send me a message if you’d like specific dimensions. 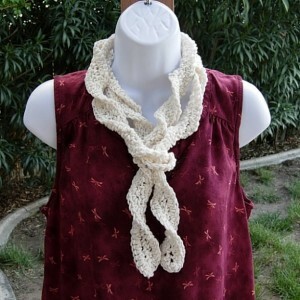 Prices will sometimes vary depending on how much yarn is needed, price of yarn, and crocheting time. If you'd rather have a different color, feel free to browse the scarves in my shop to look for a yarn and color that may work for your curtains. If needed, I can send swatches for the price of shipping and seller fees. The best yarns for tiebacks are the medium-weight and bulky ones: yarn brands such as Impeccable (double strand), Country Loom, Hometown USA, Red Heart Light N Lofty, Wool-Ease Thick N Quick, and Homespun Thick N Quick. I can also make any number of tiebacks you may need. For example, if you have a total of six panels in one room and would like matching tiebacks for all of them, that’s no problem. Just message me with your situation and we’ll talk it over. (: YARN CONTENT & CARE: 100% Acrylic. Wash warm, gentle cycle. Tumble dry low. Do not over dry. Do not dry clean. I recommend washing in a lingerie bag. Avoid washing and drying with anything that may cause friction or snag loops, such as zippers and buttons. Hand-washing is very easy to do with such small items as these tiebacks: gently hand-wash in a sink with laundry detergent, rinse with a little fabric softener if desired, roll in a clean towel to remove excess water, then reshape and air dry. For crocheted items, the gentler washing is always recommended. U.S. SHIPPING: I keep shipping to a minimum and offer First Class Package as the best value for price & speed. For Ready to Ship items, I'll ship within two business days. For items made to order, I'll ship as soon as I have the item finished (within the time-frame stated in the listing title). I use the Paypal shipping system whenever possible, so you will be provided with a delivery confirmation number by email from Paypal and/or Aftcra. Most First Class packages take two to five days to be delivered. INTERNATIONAL SHIPPING: I always combine shipping for multiple orders. I most commonly use USPS First Class International for shipping outside of the US. First Class International may take a longer time to arrive, but it's much more affordable than Priority International (which usually runs $20 or more for a few ounces). Delivery time for international packages is usually 5 to 15 business days. Customs, bad weather, or national holidays can sometimes slow down a package with the occasional shipment taking around 30 days to arrive. This only happens to about 5% of my international shipments. (: In the last four years, USPS has raised prices significantly for First Class International, in some cases more than doubling the amount they used to charge before 2013. On a positive note, as part of that price increase, they include tracking and delivery confirmation as part of the First Class service for almost all the countries I ship to. To keep shipping costs down, I will use lightweight polymer shipping envelopes as often as possible. For multiple items, I may find a cardboard box is best. International Buyers Please Note: Import duties, taxes, and charges are not included in the item price or shipping cost. These charges are the buyer's responsibility. Please check with your country's customs office to determine what these additional costs will be prior to buying. PAYMENTS: I accept PayPal. If you don't have a PayPal account, you will still be able to pay with a credit or debit card through PayPal. You can also pay from your bank account using an E-check (also through the PayPal system), but I won't be able to ship until the check has cleared, PayPal says it's okay to ship and allows me to print out a label. RETURNS: For now, I am not accepting returns, but am completely open to resolving any problems that may occur. I feel the best strategy is to head off any problems before they even happen. If you have any questions whatsoever about any items I am selling, please ask. Thanks for looking!